Steven Cottingham‘s show entitled I’ve Committed Sins No God Could Forgive ended on Sunday, September 28, 2014. I could have written about this during the midst of the exhibition. I chose not too as the second part of the exhibition will take place today. It is this part that I find most interesting. On September 30 I will use the entirety of my artist fee to have flowers (white lilies) delivered to employees of Suncor, Husky and Exxon Mobil. I suspect many have walked past this exhibition and not given it a second glance. In many ways this blog post is primarily geared toward the average employee of three significant corporate entities with Canadian and/or International headquarters located in the city – Suncor, Husky and Exxon Mobil. If one looks at the picture above, it will become self-evident why. Steven Cottingham is a Calgary artist. He is a relatively recent graduate from the Alberta College of Art and Design. He is also very involved in the Calgary visual art community. He is also writing a book about art and love, which reflects his artistic practice. Truck, is the gallery that selected the proposal that Cottingham presented for their programming. Because Truck is an artist-run centre, the work is not for sale. This is typical for most public galleries in Canada (and often elsewhere as well). To compensate the artist for the work that they have done, public galleries pay an artist fee. Usually the base amount (some will pay more) has been determined by an organization called CARFAC (which means Canadian Artist Representation and the French equivalent). This is different from how a commercial gallery works. In a commercial gallery payment usually comes as a result of the sale of the artwork. There are some exceptions, but usually the amount is determined as agreed under contract between the artist and the gallery. Cottingham will receive his fee, which was agreed in advance under contract. Unlike most artists who would typically pay bills (or whatever is their current priority), Cottingham has chosen to disperse this payment in the form of a gift. This gift will be a white lily to random employees of the three companies mentioned above – Suncor, Husky and Exxon Mobil. Why is Cottingham doing this? No doubt, this will be the question around the water cooler at these three companies. I will attempt to explain. This is an act of social justice art. First I would like to put some background to this question, before addressing it later. What is the significance of the white lily? There seems to be no consistent meaning for the white lily. However, it is imbued with significant religious meaning, consistently. Teleflora states that white lilies signify chastity and virtue. (Note 3) This website then goes to state that they are a “symbol of the Virgin Mary’s purity and her role of Queen of the Angels “. Although it is not stated, surprisingly, other websites frequently mention that white lilies are often associated with Easter which makes sense given the significance stated in relationship to the Virgin Mary in the website. In a Swerve article this past weekend, Cottingham is reported to have stated that he interprets white lilies as an “empathetic . . . flower of both sympathy and apology.” (Note 4) As a result, this additional interpretation must also be taken into consideration as well. What is the social justice message intended? It is safe to assume that this is based on both personal and larger-scale economics and resource development. This action would appear to be simply about economic disparity and/or resource development. This is an issue that requires further discussion, as we increasingly see in the news of the day. Social justice art is a form of contemporary art that I suspect we will be seeing more of in the city during the next year. What form that will take, I am uncertain. Historically, the arts (not all, but certainly the avant-garde) in its many forms (from theatre and dance to the visual arts) holds an important place at the table as artists and their work engage with politics, social justice or change and other issues. These works have not always been popular at the time they were first produced, but over time in some cases have become iconic works in due course (think Picasso‘s Guernica). I am intrigued to see what potentially may be in the works. MacNeill, Jon, “Exhibition casts light on social injustices,” [St. John, NB] Here, June 5, 2014, A26. Earlier tonight I attended the opening of Andrew McPhail‘s installation CRYBABY at the Untitled Art Society’s Satellite Gallery. This exhibition is part of Mountain Standard Time – the seventh biennial performative art festival, known more colloquially as M:ST 7 which begins this weekend in both Lethbridge and Calgary. 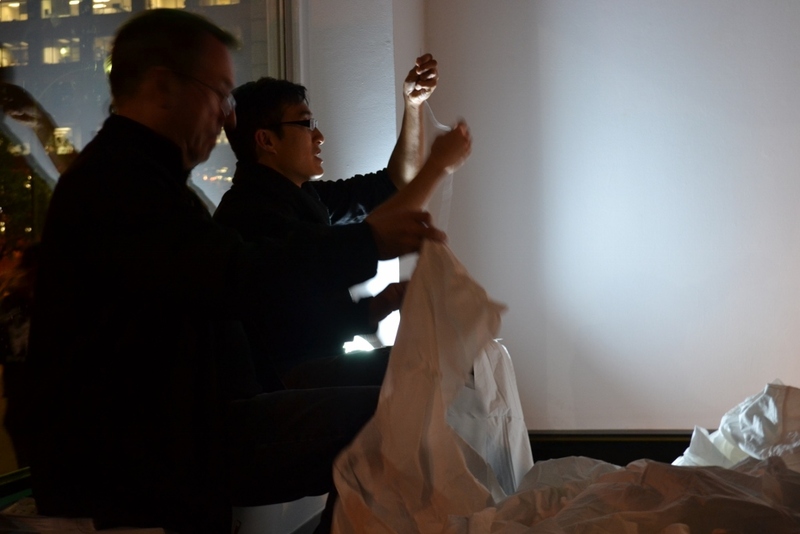 It is a quiet installation, with subdued lighting. This show contrasted quite starkly with the opening held at the same time at Avalanche! Institute of Contemporary Art in their space directly below UAS. At Avalanche! Shawn Mankowske‘s and Palmer Olson‘s two-person exhibition momento maury showed bright colours, abstract shapes along with a tip of the hat and awareness of op-art and formalist abstraction from the 1960s and 1970s. It is an odd combination to see in Calgary. Formalist abstraction has never gained significant traction and had very little impact in the city during its heyday (or since). I could probably write lots about this odd disconnect as it is something that has fascinated me for quite some time. As stated above Andrew McPhail’s CRYBABY installation at UAS is subdued and accentuates the sublime nature of the work – especially at night when I attended. The absence of natural light lends itself well to the exhibition and the somewhat theatrical lighting made it more dramatic than it probably otherwise would be during daylight hours, when the gallery receives natural light. This is an ongoing installation begun in 2010 that has been installed previously at two separate locations – Union Gallery at Queen`s University in Kingston (2011) and at TH&B at 270 Sherman (the former Imperial Cotton Mill) in Hamilton (2012). Briefly this work originated as a result of an experience the artist had while making a trans-Atlantic flight. His seatmate, whom he did not know, suffered a heart-attack while en route and passed away. This work came as a result of this experience. It is a memorial of sorts to this unknown person and the often overwhelming nature of grief. The work itself is made up of thousands of Kleenex tissues that are individually stitched together. At the opening and various times throughout the exhibition the performative component of the show as part of M:ST 7 has the artist stitching tissues together and engaging viewers in dialogue with issues surrounding the work. This situation that led to this work is a sad circumstance. However, it is something we all can relate to. We all will encounter death, sadness and loss at some point in our lives. It may be someone we know, a relative or someone we have loved. It could be a casual acquaintance we once knew. It could be a random circumstance such as what happened to McPhail. Or in a similar way like myself when I was bicycling home yesterday and chanced upon a policeman calling for an ambulance (I assume) while he stood near a fellow who appeared to have fallen, and was lying motionless on the concrete beside an apartment building, with what appeared to be blood in the area of his head. Who knows how long he was there. For that matter, we could even ponder our own failing health or those family members that we are closest to. It is these together – the all too frequent points in our lives, where we are reminded of our own frailties and the transitory nature of life itself. The Argument of the Form of Life, or The Final Argument. There has been much discussion over the centuries about how we deal with the issue of grief – and death. It is something that we must all come to terms with in our own way. However, this is an important discussion to have, as it has deep resonance with all. What happens when our mortal life ends? This all brings me back to the Avalanche! show in a circuitous and very odd, but related way. The choice of title momento maury for Mankowske‘s and Olson‘s exhibition riffs off the centuries old Latin phrase momento mori which roughly translated means “remember (you have to) die”. This phrase is interesting as it carries a lot of philosophical, art historical, musical and religious baggage and is frequently referenced throughout the centuries. As an aside, this Latin phrase in the exhibition context with the title, is also mildly humourous – which is probably the intent. This is especially so, when one reflects further upon the theories of Clement Greenberg and formalist abstraction which their paintings reference. Returning once again to McPhail’s work we see that he also draws from the concept of momento mori. 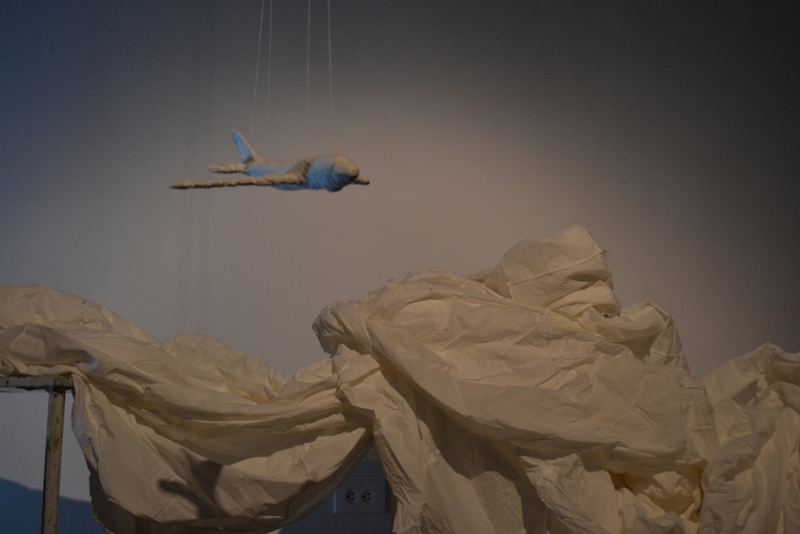 Even the materials used – Kleenex tissues – also talk about the ephemeral nature of life. That is what good art should do – give the viewer something to think about. Put the UAS show in your list of things to view. While there, make a slight detour, go down the stairs and visit Avalanche! as well. 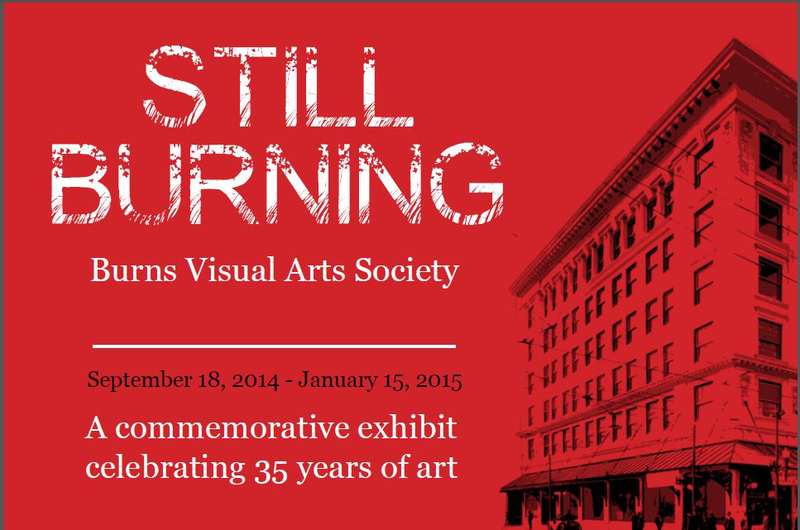 Recently I wrote about the Burns Visual Arts Society and their 35th anniversary. As I was doing preparatory research for what I wrote, I encountered a news story that talked about the Neilson Building, and the space crisis for a number of arts organizations that were evicted to accommodate new buildings in 1996. One of those organizations mentioned was The New Gallery which returned back to its original home it had 20 years prior. The building they returned to was a small two-story commercial building facing 9th Avenue between 4th and 5th Streets, directly behind what was once Penny Lane Mall. If I was to guess it stood about where the East Lobby for the Eighth Avenue Place now is. Long story short, they stayed at that location for approximately 10 years. Most of those years I served as the treasurer for TNG. In turn as is often expected in Calgary for arts organizations, the building sold and they once again were evicted. It is all in the name of progress. It is the reality more often than not and just the way it is. TNG has in turn occupied three different spaces, each time moving for the same reason significant renovations planned for each of the buildings they occupied – first it was Eau Claire Market (they had two different spaces there); then it was Art Central and now they are in Chinatown. 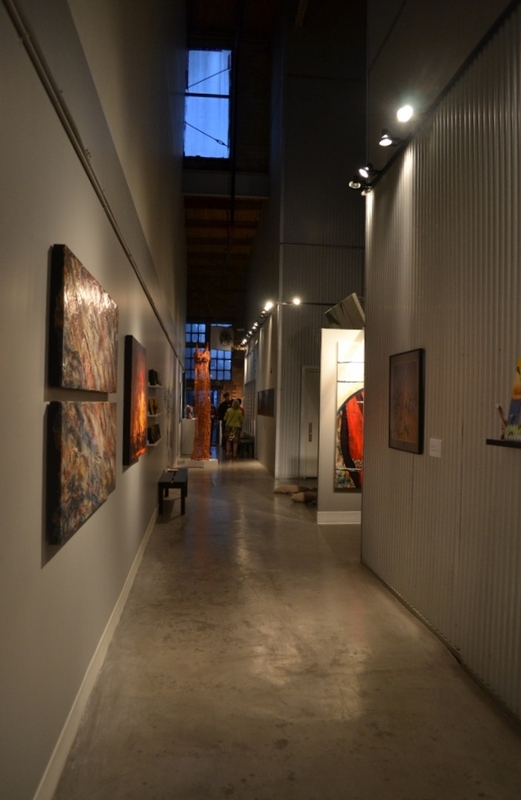 In addition Penny Lane Mall at various times housed commercial galleries, art exhibitions, pop-up galleries and artist studios over the years. In some ways it was a bit of a dead mall, but that was what sometimes made it possible for these organizations to survive. Underutilized commercial or retail spaces are an important part of the ecology for visual artists and arts organizations. After my circuitous and rambling pre-amble . . . The building that rose from the rubble of these two buildings (and others), is now known as Eighth Avenue Place. There is a bit of an acknowledgement of the history of what once stood on the footprint of the current building location. It is a nice touch. Sadly so much of the knowledge of our city’s built history has been lost over the years. It is found on the +15 level near where SQ Commons once stood. It was in the midst of where the Art Forum Gallery Association‘s initial show which featured a retrospective exhibition of work by Alberta College of Art and Design instructor Dave Casey, the opening of which was held in October 2013. It is a very interesting building with intriguing architecture. It is more unique than most in the city. I have intended to write about it for quite some time. I just have never got around to it. A few days ago (Monday, September 22), I noticed that workmen with masonry drills and scissor lifts were installing large illustrated signs on the cement walls on the 5th Street SW underpass – a place where there has never been any signage or artwork previously (except for maybe the occasional piece of graffiti). This underpass is below the railway tracks between 9th and 10th Avenues. I continued on my merry way, but noticed artwork had been installed upon the large plywood or MDF panels, similar to what was done on the construction hoarding when the west tower of Eighth Avenue Place was being built last year. At the time I thought the use of artwork on the construction hoarding to be a great way to promote Alberta artists and artworks. Of course this was rather fascinating for me to see, as only a month or two ago I wrote about the temporary chalk figures installed in conjunction with Beakerhead on the 4th Street underpass (on the other side of the block). They were there earlier this week, but have subsequently been painted over by Friday evening, September 26. Recently, like within the year type of recent, the West Tower to the two tower Eighth Avenue Place was being built. The exterior construction of the second tower is now complete and the new portion of the complex is in the process of being populated with new office workers. Beginning on Eighth Avenue, following south on Fifth Street and then east along the busy downtown thoroughfare of Ninth Avenue, a continuous stream of art images engage the eye. Enlarged and reproduced on the construction hoarding at Eighth Avenue Place, this outdoor display of original works of Alberta art is a first for the city. 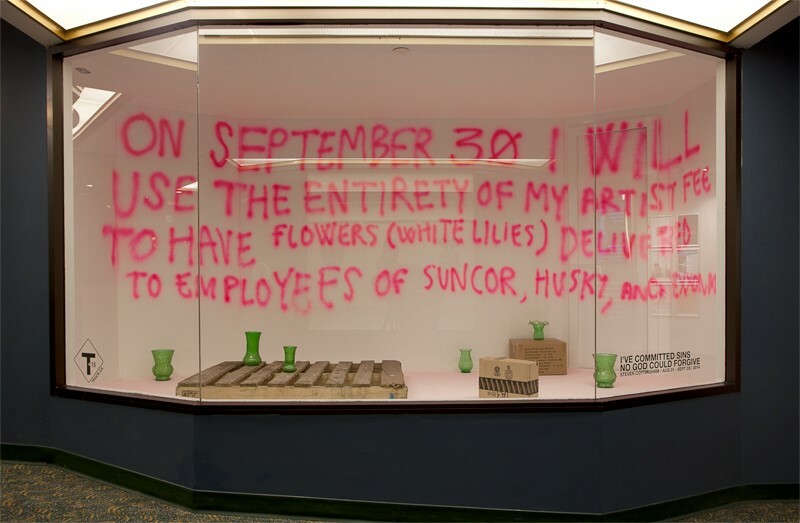 A unique affirmation of Eighth Avenue Place’s commitment to Canadian art. When this first went up probably about two years ago I was very excited to see some familiar works, some of which I had handled in a gallery sales situation previously. One of the works (a Helen Mackie print) I had even used for the print invitation to a solo exhibition of her work. It was truly a wonderful thing that the property owners (presumably) and/or property managers did to draw awareness to Alberta art. It is my wish that more situations would continue. The visual arts is a very challenging place to gain traction and positive awareness in this city. So any little piece of assistance, however small it may be, is greatly appreciated – not that I am working in that field anymore. This of course relates directly to my previous comment. In all there probably was somewhere in the range of 50-100 images used, with a template of the artists, titles and acknowledgement of collection (if applicable) found on each wall for reference. The choice of selecting Alberta landscape based art was spot on, as it lent itself to the architecture of the building which features an irregular roofline on each of the two towers. This no doubt was meant to mirror the physical attributes of mountain peaks in an architectural manner. The external architecture and the external design of the construction hoarding worked well together. I am uncertain exactly when this happened, but if memory serves me correct, the hoarding was removed at some point in the last couple months (maybe around Stampede?). I thought I had photos of the installation. After review, apparently I do not, nor could I find photos online. I would have been nice to have this for comparison purposes. This rambling conversation leads me to the current installation on the 5th Street SW underpass. As I looked at the works, I noticed a strong resemblance to those that I recall seeing on the Eighth Avenue Place construction hoarding last winter. In fact as seen in the photo below, four of the sixteen works are illustrated in the small brochure I have in my possession – Annora Brown, E.J. Hughes, Ron Moppett, and Walter J. Phillips. This leads me to believe that those involved in putting up the construction hoarding at Eight Avenue Place, somehow must be involved in this as well. It would sense as it is practically across the street from where these images once stood. My curiosity is, what is the connection? There is a new development called Place Ten which is located between the 4th and 5th Street SW underpasses, facing 10th Avenue (as seen in the picture below with the base of Eighth Avenue Place the primary building complex directly behind the construction site. That would make this new construction site as being bounded by two sets of artwork- the Beakerhead art on one side and the Eighth Avenue Place art on the other. Is this the connection? Are both projects owned by the same ownership group? These type of selections always will involve a certain amount of second guessing. It is the nature of a curatorial project such as this, and is as predictable as death and taxes. The questions almost always are: 1.) why did they include these artists, and 2.) who did they miss? As a result, I will try to keep my comments in this regard to a minimum. Of course the most obvious question is why was Illingworth Kerr selected three times and someone like Marion Nicoll whose work is included in the brochure photo I have included above, not included at all? The other interesting question is why was E.J. Hughes included? E.J. 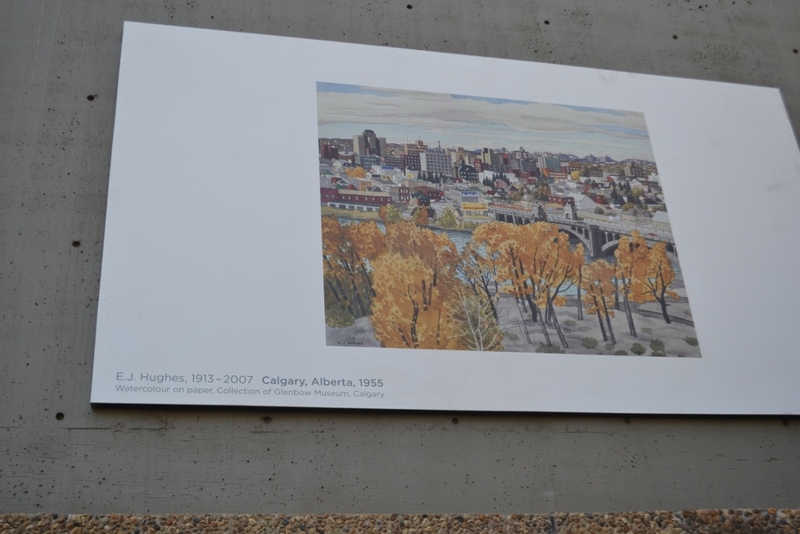 Hughes hardly can be called an Alberta artist. He had very little connection to Alberta outside of a short training period on one of the military bases, prior to being dispatched to serve overseas with the Princess Patricia’s (or the PPCLI) during WWII. Having said this, I am of the opinion that he is definitely an important artist worthy of inclusion in a Canadian landscape survey show. I have often wondered and this is probably a rhetorical question more than anything else. Was this painting produced as a result of Hughes potentially being on holidays in Calgary during 1955? If so, did he attend the internationally travelling exhibition put together by Seagram’s entitled Views of Canada when it was on display at the old Calgary Allied Arts Centre (just down the street from where it is currently installed) in 1955? 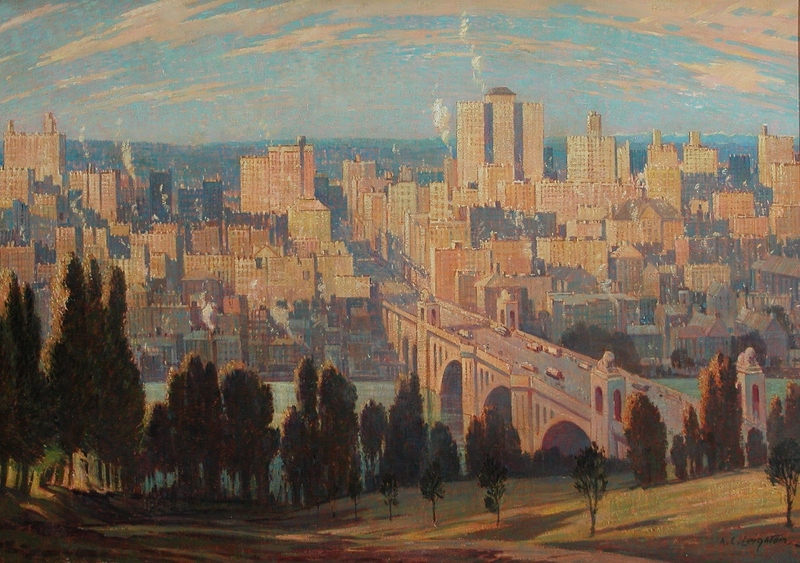 I wonder this, because A.C. Leighton (another Alberta artist who should be included) painted a very similar view of the Calgary skyline dated 1951 which is in the collection of the McCord Museum in Montreal. Recently many of the works were brought out of storage and re-circulated a few years ago. One of the stops in this most recent tour, was the Kamloops Art Gallery in which they illustrated the Leighton painting in this essay. As one can see from the two photos I have placed below for comparison purposes they are both taken from almost the exact same viewpoint on Rotary Park at the top of the Centre Street Bridge. Notwithstanding my comments about Hughes stated above, the work shows how others from elsewhere have interpreted the Alberta landscape. This situation was relatively common from the pre-Confederation era with early explorer/artists such as Paul Kane and William G.R. Hind (along with often forgotten anonymous aboriginal artists who produced petroglyphs and carved effigies found at places such as Writing-on-Stone Provincial Park and other traditional Native hunting grounds) until about the 1960s or 1970s when the provincial art scene could be considered to have begun its “coming of age” as evidenced by the Made in Calgary series of exhibitions hosted by the Glenbow – the final installment “the 2000s” which opened half the show last night at the Nickle Galleries at the University of Calgary and the main portion of the show which opens tomorrow at the Glenbow. It could be argued that half the artists featured came from elsewhere (Foo Fat, Gissing, Hughes, Kerr, Moppett, Phillips and Taylor). This has not stopped their impact upon the art history of the province. 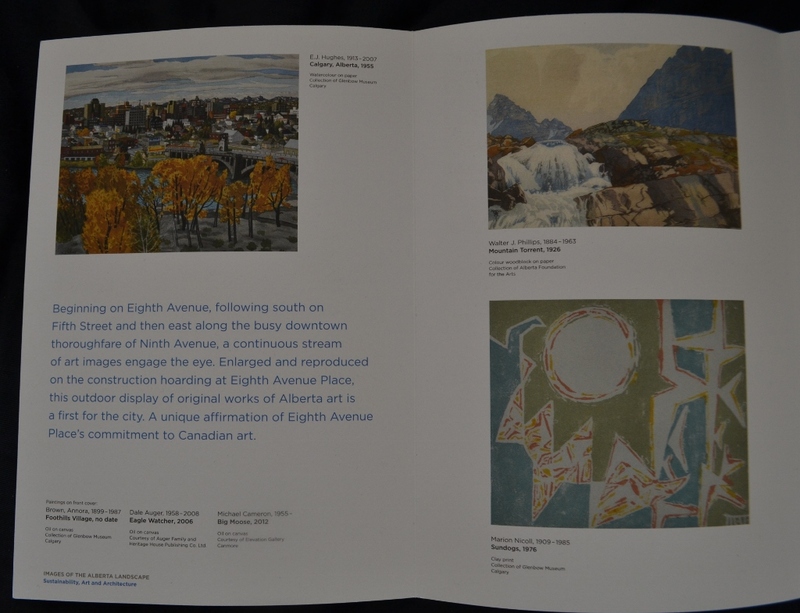 This is evident from the place both Kerr and Phillips have, since both artists have public galleries named after them at the Alberta College of Art and Design (Kerr) or the Banff Centre (Phillips), recognizing their individual significant contributions to the province. In the body of this posting I indicated uncertainty about how these works ended up on the wall of the underpass. Quite by accident, when I was looking for something else, I stumbled upon something that helped solve this for me. The mystery has been solved. 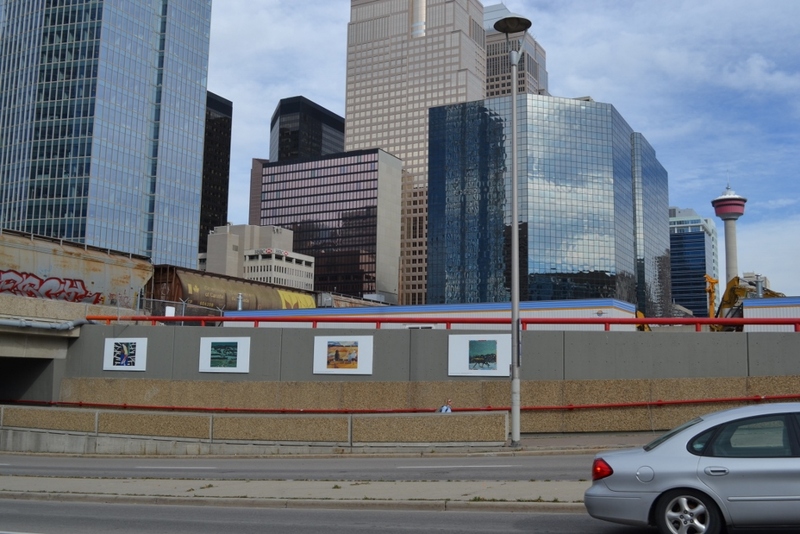 In early 2014, the Eighth Avenue Place Ownership Group offered the City of Calgary the gift of a number of graphic art panels that previously adorned the construction hoarding on their site. The Centre City Underpass Enhancement Program is being implemented to achieve one of the objectives of the Centre City Plan: to make the Centre City a ‘walkable place that is safe, secure, accessible, legible, interesting and enjoyable for pedestrians’. I believe that it does do this. It is also increases awareness and introduces an educational component regarding art from the region in a public setting. This is an important thing that is necessary to grow cultural awareness of the visual arts in the city. For that I applaud this initiative. Earlier this month I posted some erroneous news about the Gorilla House and Rumble House in amongst some factually correct information. In my previous post, I was upfront about my speculation regarding their new location. Today I received confirmation that my source was wrong. This post is therefore to correct that erroneous information. I don’t feel particularly bad about the fact that I was wrong. Maybe I should, but I don’t given the circumstances. In it inevitable that things like this will happen for time to time. It is obvious now, that I was not alone in being mistaken. In the Fall 2014 edition of Stephen magazine (the one that is currently available) there is a double page spread on pages 32-33, showing photos of members of the Gorilla House/Rumble House team in the “5,500 square feet of unused space in front of the Day’s Inn on Macleod Trail.” The remainder of the article leaves an impression that this was going to be their new home. I understand the nature of lease negotiations all too well. From recent personal experience, I had an extended conversation for over a month with a landlord about occupying and leasing a vacant commercial space for the entire two summer months. The day before I was prepared to move and a couple days before I had targeted as the first date of active operations from our very first conversation in May, the deal fell apart – suddenly. I have previously written for different publications. From that experience, I know that glossy magazines usually require a longer and sometimes significant lead time prior to publication. Glossy magazines don’t have the quick turn-around that a blog or newspaper has. I read news from yesterday that Rumble House has signed a lease for a space on 8th Avenue SW, near Mewata Armories, Millennium Park, Kerby Centre and the old Science Centre/Planetarium. Ironically I passed their new location last week (before they put up the current for lease sign). I was thinking to myself as I did that, that the space Rumble House has leased looked vacant and I was also thinking that it potentially could be a good space for a gallery. 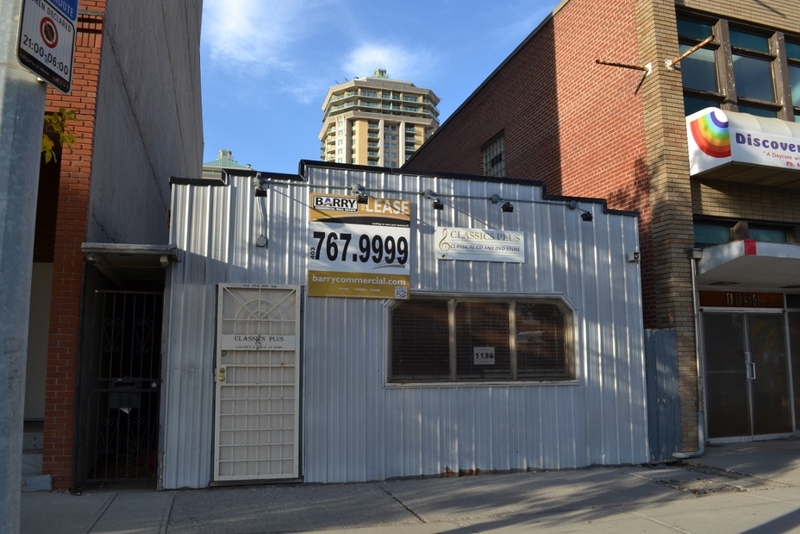 The new location will be at 1136 – 8 Avenue SW. It most recently was used as a retail space for a store that sold classical music recordings, called Classics Plus. Prior to that if memory serves me correct, it was an English Fish and Chips shop for quite some time. Classics Plus has been located there or next door in the building to the east (a two story, plus basement mid-century building) that once housed Virginia Christopher Gallery, three or four moves before the gallery closed a few years ago. That building next door also housed artist studios, the short-lived Deacon-Ulrich Gallery and long-term tenant Fine Art Framers. As seen from the tenants it once housed, the building next door was definitely an arts friendly building at one point in time and from what I understand it has subsequently been sold. From the news that was released from Rumble House yesterday, it appears as if they intend to open during October. No date has been set. It is my opinion that this will be a much better location for Rumble House than the Day’s Inn location. I wish them success here. I will definitely stop in and visit, once they are up and running. Last night, I attended the opening of the 35th anniversary show of the Burn’s Visual Arts Society (BVAS) exhibition held at Passage. The space where it was held, literally is as described, a passage between two buildings in the old Dominion Bridge building complex in Ramsay. This is an event that I have looked forward to for about a month, when I first heard that it was in the works. Whenever I have been able, I have made best efforts to attend the Burns open house. It only happens once a year, and more often than not I usually had to work which always made it difficult to attend. This year the open house will be next weekend. That is the weekend which corresponds with Alberta Culture Days and ArtWalk (which amazingly within the last year has come back from the nearly dead). The same can’t be said for ArtCity, which went from a yearly event, to a biennial event, until last I heard it was registering a flatline. The Burns Visual Arts Society has an interesting story. It is a story few know about. The organization should be known more as many of the past members of the Society have gone on to great artistic success both here and elsewhere. As you can see by the incomplete list of past members below there have been some important artists who had studios in the BVAS that achieved a certain level of critical success such as Martin Bennett, Dennis Burton, Mark Dicey, Greg Edmonson, Marjan Eggermont, Marianne Gerlinger, Mark Joslin, Ron Moppet, Arthur Nishimura, Evan Penny, Bill Rodgers, Noboru Sawai, Jeff Spalding, Bev Tosh and Peter von Tiesenhausen. I must admit there is not much available to work with in terms of public information about the Burns Visual Arts Society. In some ways this is to be expected as most visual artists quietly produce work in the confines of their studios – with little fanfare. It is a solitary career for the most part. 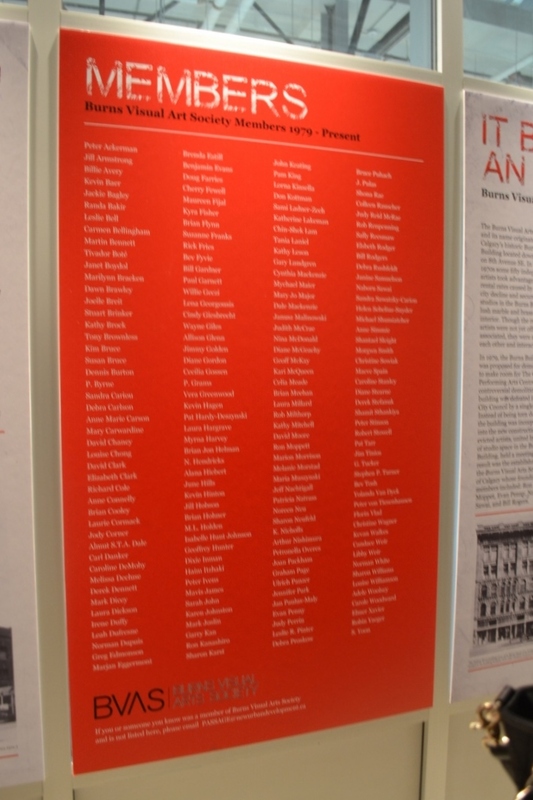 When there is information, it is usually in conjunction with the individual artist’s work being produced, sometimes years after the fact when an exhibition is mounted and the artist acknowledges the contribution that the society did to enable and provide a supportive environment to create the work. Even then there is little discussion about the place where the art was produced, but rather about the artist him or herself. Fortunately, I have an amazing library as it relates to art from the region and have worked in the business and attended numerous exhibitions and networked with artists and administrators with amazing regularity in Calgary for a very, very long time. . . This is a milestone exhibition. This is something definitely worth celebrating. This fact alone shows how difficult it is to keep an organization such as this going. It is an amazing feat that this cooperative society has survived this long in Calgary. No doubt it also speaks to the 175+ artists who been involved in the organization over the past 35 years. The numbers alone would indicate that each artist stays for over five years on average. Some have stayed longer. Artists such as Bev Tosh, Louise Williamson and Cecelia Gossen have maintained studios at BVAS for substantial periods of time and in so doing have been the glue that holds the organization and in so doing have provided the stability allowing the organization to flourish. So a catalogue is definitely in order and is available from BVAS for $20. I am glad to see that it happened. And in colour too. I must hand it to curator Colleen Sharpe who wrote an essay for the catalogue. In talking to her last night she indicated that the catalogue was only put together in two weeks. From the significant amount of research I have done in this area over the past couple years, I know this for a factas I have stated above, there is not much material to work with to create a history for BVAS. So as a result, she must be commended that she was able to create as much as she did. Having worked with Colleen before, I knew that the show would be well-curated before I even got there. Colleen does a good job in what she does. I am one of her biggest fans – maybe even her biggest. What is stated below is a bit more history on the Burns Visual Arts Society. This is all primarily new information and is not in the essay. On Thursday, December 28th, 1978, midway between Christmas and New Years Eve, the tenants in the Burns Building were evicted by the landlord and told to vacate their spaces by January 31st, 1979. This was not surprising news as only a month earlier, the Globe and Mail reported `that “the city is assembling the four city blocks, bounded by 7th and 9th avenues and 1st and 3rd streets SE, to hold a new city hall, a centre for the performing arts, and possibly some commercial development.” This area incorporates the geographical area incorporating what is now known as Olympic Plaza, the Calgary Centre for Performing Arts and City Hall. In 1979, building permits were forecast at the end of January to be $1.3-billion. The city was in the midst of the great boom that ended in 1980-81. The Burns Building was in a seedy area at the time. Across the street also facing Macleod Trail stood the Queen’s Hotel along with neighbouring Alexandra Hotel which were part of what was a seedy part of town, what was once called Whiskey Row. Both of these hotels were subsequently demolished to make way for the new City Hall Building and the Centre For Performing Arts. Initially, this was all part of Mayor Ross Alger’s planned $234-million Civic Centre project and was the subject of a November 29, 1979 plebiscite to approve the project. That first project was defeated by 1841 votes. This controversial project, of course, was partly responsible for bringing former CTV News, City Hall reporter, Ralph Klein to the mayoral seat in 1980. The end result was that the project still went ahead a couple years later, only that it changed somewhat. There were a number of artists who maintained studios in the Burns Building. The Burns Visual Arts Society was formed as a result of the December 1978 eviction with artist Bill Rodgers acting as spokesman for the group. The City at that time was largely unsympathetic to the artist`s plight as evidenced by Alderman Barb Scott‘s comments where she bluntly stated that the Burns Building was private property and the artists should not come to the City for help with relocation. However in Barb Scott’s defence, she did indicate that with little more than 30-days notice “there (was) no need (to) vacat(e) for several months”. It was in this context that artists such as Evan Penny, Laura Pope, Wayne Giles, Bill Rodgers and others established the Burns Visual Arts Society as a cooperative in 1979 – 35 years ago. Ironically, as a side note, and this more of a happenstance than anything else, earlier this year Calgary Arts Development Authority and Studio C both relocated to the Burns Building. So the arts now live again in the Burns Building as this has almost come full circle. The next home for the BVAS was on the fourth and fifth floor of the five-storey Neilson Block located at 118 – 8 Avenue SE just over a block away from its former home. During that time, the Neilson Block definitely was a visual arts friendly building. The Off Centre Centre (now known as The New Gallery) was also located in this building on the third floor for a number of years. Also there was a hair salon (the name of which I forget) on the second floor that also regularly featured artists and openings. This building with its close proximity across the pedestrian mall from the Glenbow Museum, was operated as normal until it was sold in 1995 with plans for redevelopment were announced. This resulted in changes starting to happen. The society remained there until they were forced to relocate in 1998 as a result of the new Telus Convention Centre and Hyatt Hotel construction and redevelopment which affected the entire block that the Neilson Block stood on. The building façade has been retained and incorporated into the design of the new part of what was then known as the Calgary Convention Centre. It was at this time that the BVAS moved to its present location 828 – 24 Avenue SE in the community of Ramsay, where it is still located. It is situated almost directly across the street from where the art space Passage, where the exhibition Still Burning is hosted, on the site of the old Dominion Bridge Building. This site where the exhibition is held is notable for being the site where Dennis Oppenheim‘s controversial sculpture Device to Root Out Evil was located between 2008 until it was quietly removed in January of this year at the end of its five-year lease. In addition, it is notable for housing a number of artist studios, production shops and was the original home of NewZones, a commercial gallery, before they moved to their present location on 11th Avenue SW. Overall this is a good show. It is well worth a visit. I am glad to see that they acknowledged the current 20 members of the Studio Collective. They also tipped a hat and acknowledged the contributions and memory of former members who are no longer involved or have passed away. They did this by including a major dress piece by long-term member Elizabeth Clark who passed away suddenly on March 10, 2008 as a gesture of tribute and by including recent studio artist Graham Page who also passed away suddenly from pancreatic cancer this past summer on July 6, 2014. 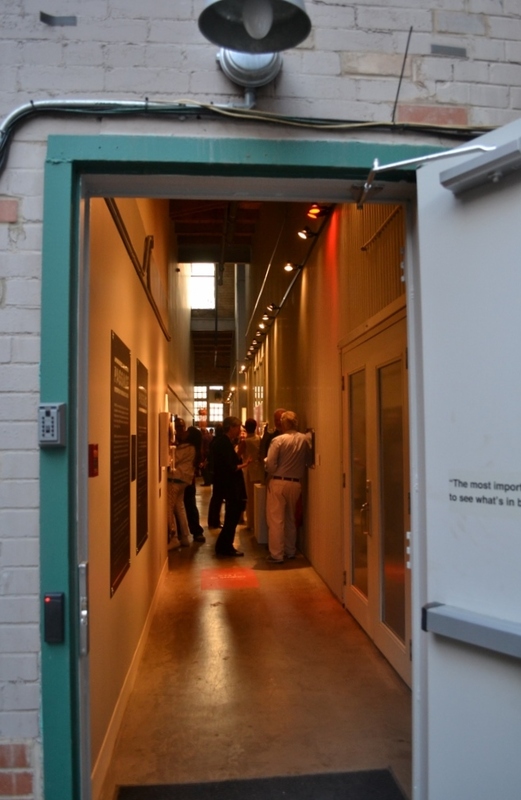 Make sure you include a visit as part of the East Side Studio Crawl which was initiated by a couple of BVAS members Cecelia Gossen and Celia Meade in 2003 which was based loosely on a similar successful initiative that was held in Vancouver around the time that it was established. This event will take place this weekend on September 20. Timing can make up for a lot of things. If you happen to be at the right place at the right time, sometimes that is more important than how talented one is. A very good example of this is in picking stocks. It is possible that someone can do excellent technical and fundamental analysis, and also be the smartest guy on the block, but if they don’t have good timing it doesn’t matter how good they are. Today I heard a piece of fortuitous news for the Glenbow. It is possible that they may not even realize this as it hasn’t even been published in print edition of the newspapers yet. 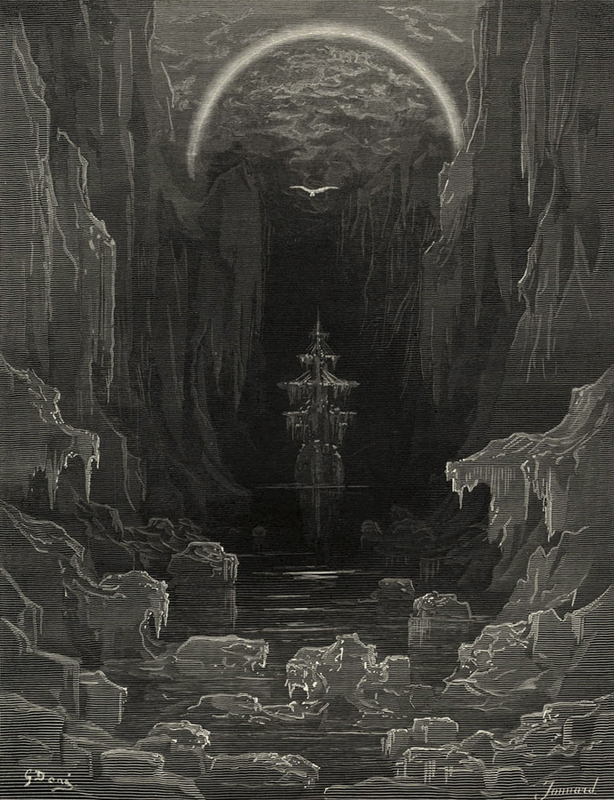 This afternoon (only a few hours ago) it was announced that one of Sir John Franklin‘s two ill-fated ships (HMS Erebus and HMS Terror) that tried to find the Northwest Passage in 1845/1846 has been found. The news reports I found online say it is too early to determine which one it was. This will no doubt be considered as being sort of big news for Northern Development and Canadian Nationalism and Sovereignty in the Arctic. Why is this incredible timing for the Glenbow? Later this month on September 27th, the Glenbow will be opening a new in the third of a four-stop travelling exhibition originating from the Whatcom Museum just a few kilometres across the Canada/USA border in Bellingham, Washington. This exhibition entitled Vanishing Ice: Alpine and Polar Landscapes in Art 1775 – 2012 ties in well with this breaking news. What ties in even better to this news, is a parallel exhibition that the Glenbow is producing from its own collections, entitled From our Collection: Searching for the Northwest Passage. This all seemingly has presented the Glenbow with excellent timing to host this travelling show and its own planned show. Congratulations to the Glenbow on the excellent timing. I am sure that it will be a beneficiary of this increased awareness and attendance as a result. Anonymous, “There were strange things done in the midnight sun in 1825 – was it hockey?” National Post, February 18, 2006, A9. Graham Fraser, “Arctic defence; Sure, he missed the AIDS conference, but Stephen Harper made waves in the Arctic this week. But were the PM’s tough words on Arctic sovereignty anything more than just mere talk?” Toronto Star, August 19, 2006, F1. Randy Boswell, “Finding lost ships will help claim on Arctic” Edmonton Journal, August 16, 2008, A1. Greg Lyle, “Hugging our heritage while cutting our culture” The Globe and Mail, August 21, 2008, A17. Tom Ford, “Arctic region heating up; Conservatives hope to make the Arctic a key issue in federal election campaign” The Guelph Mercury, September 16, 2008, A8. Tristin Hopper, “Ice, terror & darkness; After 160 years, an underwater robot may finally be able to find the final resting place of the doomed Franklin expedition’s ships” National Post, July 05, 2011, A4. Randy Boswell, “Fate of fabled sunken ship continues to hang in limbo; Canada, U.K., to resume talks on Investigator” Calgary Herald, August 18, 2012, A8. Randy Boswell, “Franklin ships may have been found; Parks Canada seeking doomed Arctic expedition” The Windsor Star, September 25, 2012, D6. Shane McCorristine, “Searching for Franklin: A contemporary Canadian ghost story” British Journal of Canadian Studies, vol. 26, no. 1, (2013): 39-57. Kat Long, “Franklin Fever; How the oddly obsessive search for two sunken British ships in the Arctic became a centrepiece of Conservative Canadian nationalism” National Post, May 22, 2014, A13. Alex Boutilier, “Full program on tap for PM’s Arctic sojourn: Harper slated to take part in ‘sovereignty exercise’ during ninth pilgrimage to the North” Toronto Star, August 20, 2014, A6. Michael Den Tandt, “To touch the hand of Franklin; The search for the ill-fated British explorer is being used by the Harper government to promote Arctic development” National Post, August 26, 2014, A3.